Published by Dimira Teneva in Customer retention marketing. 8 mins to read. *Money values are in US dollars to unify data from across countries and currencies. Our sample of 65 businesses reaches an average retention rate of 28.2%. That means on average 28% of customers place more than one order with a certain shop. Also, overall, almost 60% of revenue comes from old customers as opposed to new (first-time) customers. Time between orders is a metric that can vary hugely from product to product, which can be seen in the table. Meal deliveries get ordered every 41 days on average while coffee for home – every 148 days on average. The number of orders per customer ranges from 1.5 for tea to 2.3 for coffee. Interesting! Maybe it has to do with the fact that most tea brands in the sample are detox-oriented, which means they are not a staple like coffee but only consumed temporarily. As for LTV and AOV, CBD is the clear winner (we work only with CBD businesses that operate in regions where CBD is legal). Now let’s go over the most interesting categories. In this category, it is clear how customers are willing to spend more after the first order has gone well. Naturally, the first order is a test of the quality, fit and so on of the clothes, but once quality is proven, they are happy to order again – almost 60% of revenue comes from returning customers although they are 26% of all buyers. *The average LTV and AOV may seem low, but keep in mind the report includes brands from very different countries where standard prices may differ widely. We’ll highlight the most interesting and effective tactics the brands employ to drive customer retention. One of the fashion brands lets customers choose a discount at checkout from a range up to 35% off. If a customer chooses to pay the full price, delivery is free. This simple trick gets them the highest share of revenue coming from return customers in our report, 73%! Another brand makes Paris-inspired clothes for plus size women, which is something quite specific and targeted. The brand is born out of a personal need of the founder to find such clothes and it obviously attracts others as retention rate is as high as 36.7%. If you want to make clothes people love, ask them what to make – that’s the philosophy of another fashion label we work with. They post new designs on Instagram and let fans choose which ones get made. This drives purchase frequency to a category-low of 78 days as people are eager to get the styled they voted for. This category holds the record for the highest retention rate, 36.2%, in our report. Buyers of CBD oils, liquids and other such products turn out to be very loyal to their preferred shops, making them as much as 68.5% of revenue. Also, the AOV and LTV can make other product categories jealous. Since there are still strict regulations on advertising CBD products, those companies have to rely on under-the-radar communication channels like email. Most big CBD shops have professionally done email newsletters with useful info on the different kinds of products. We see email drive as much as 40% of sales to existing customers (once they get the email contact). In such a sensitive industry where many people use the product for medical reasons, quality appears to be a driving force. The absolute winner in the category – a shop with the insane 52.7% retention rate and 94.5% of revenue coming from repeat customers, receives raving reviews about the freshness, safety and taste of its product. For the more adventures audiences, such as the users of CBD products, variety in forms and methods of intake matter. The brand with the lowest time between orders manages to get an order from each customer roughly every 42 days thanks to a huge product range for different needs. They also feature video testimonials on YouTube, and other user-generated content as way to showcase those different uses – for pain relief, curing insomnia and so on. Coffee is a staple good in many homes so it’s naturally a retention-oriented business. Our clients consistently find direct offers and take-it-or-leave it approach to work best because you either need coffee now or don’t. That’s why properly timed reminders to get a new pack of morning brew work great in this category. People don’t want to run out of coffee. Our clients use the metrics time between orders to calculate the right time to send a reactivation email just when it’s needed. A coupon only helps the conversion. The best performing brands care about the taste and ethics of their coffee. They often offer sampler sets to new customers to help them choose the blend they like, thus creating a positive experience and stimulating loyalty. If you sell coffee online, too, don’t underestimate holidays. Some of our clients discovered that coffee makes a great gift and their holiday sales are the peak of the year. A quick revenue trend analysis can show if you’re missing out on opportunities as well. The cosmetics industry is notorious for its low customer loyalty and deal hunting. The big drugstore brands rely almost exclusively on discounts in a zero-sum game: whoever has the best price for shower gel this month, wins the largest market share. 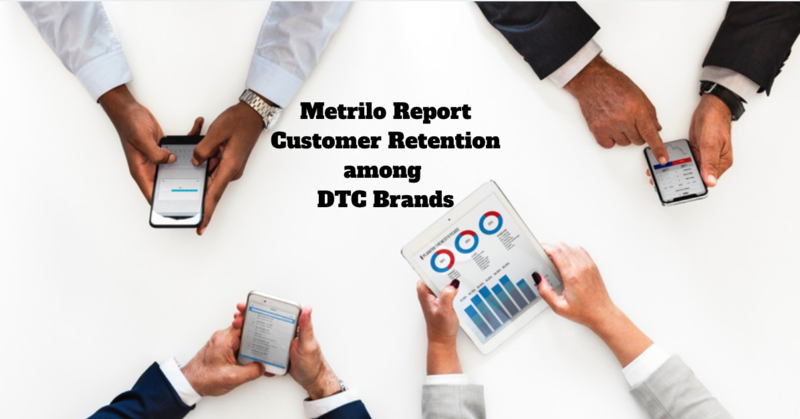 DTC brands, however, are different, differentiated actually to cater to specific needs and customer groups. They cannot and don’t want to compete on price. That’s why they manage to rack up the amazing 25.9% average retention rate and 63% in revenue from returning customers. The successful DTC cosmetics brands start out as solution for very specific problems – skin conditions like vitiligo or allergies, ultra sensitive skin, skincare for rough climate, or for ethical reasons – like vegan perfumes, for example. The brand with the astonishing 42% retention rate makes cosmetics with a special ingredient that fight problem skin and inflammations. Those brands employ science to develop better and effective products that attract eager and sometimes even desperate for a real solution customers. Often they work with an expert chemist or a medical doctor to ensure their products really work. The nature of such products makes it ok, if not expected to start with a small product range. It shows care in the development of the products. It also helps create brand awareness as early adopters remember the brand for its focus on the core customer problems, not blurred by hundreds of products. This category consists of brands that make and sell their proprietary clothing for specific sports. This includes high-tech running tops, large size workout clothes for huge bodybuilders, body-positive gear for strong female athletes, etc. Given the category specifics, it’s no wonder the average retention rate is one-third! And the short time between orders, 71 days only, means those brands manage to make their customers happy. All brands in the report talk to their target audience only and ignore anyone who doesn’t fit the ideal customer. This means inside jokes and slang, friendly motivation and creating the overall feeling that these people know what they’re talking about. One brand has such a strong community that they organize their own conference/ motivational meetup. Not surprisingly, the best reorder frequency is achieved by a brand that creates high-quality workout content. The category can make huge use of content on all social platforms as well as on site – video, downloadables, interviews, even interactive menu/ workout customer tools. Meal deliveries are a tricky business. Usually, they work as one-off or subscriptions for cooked meals. Some offer custom menu options for the week. The focus is on healthy, freshly prepared food. Since customers can order either one meal or a daily/ weekly meal plan, the desired option (maybe weekly plan) is best highlighted to draw the attention and increase order value. One such order is worth 7 individual meal orders with one delivery, which improves profitability and prolongs the customer lifespan.